Use mirethMusic to play tracks from your Music Library, from Play Lists, from Play List Group, from Audio CDs, MP3 CDs or DVDs, from a USB Flash drive, or any music file on your computer. You can play most formats. From the “mirethMusic” menu, select “Preferences”. 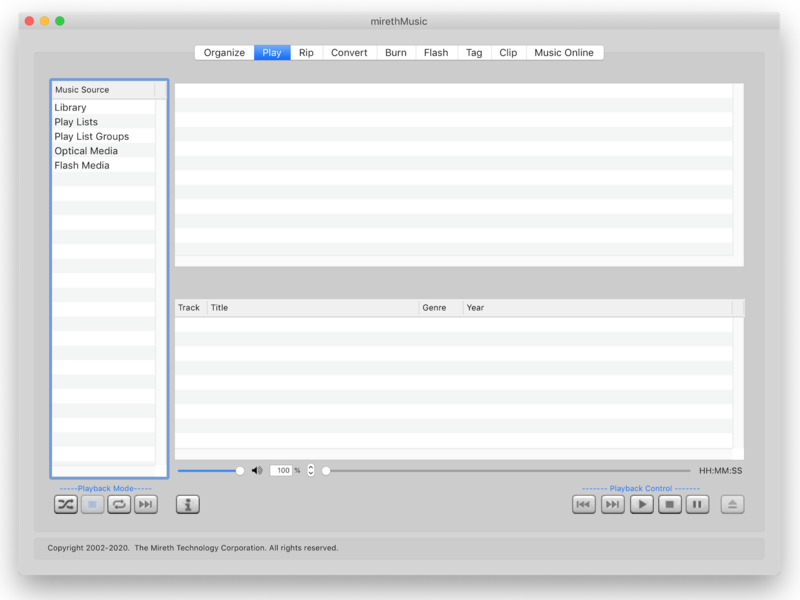 All Media Tab:Playback Control:Automatically play removable and double clicked media – Tick this box to play the CD or Flash Media when it is inserted into the computer and to play tracks associated with mirethMusic when they are double clicked. If you do not select this option, you need to use the Play tab to select tracks that you want to play. If you’re playing from a CD, MP3 CD, or DVD, insert it in the drive. If you’re playing from a USB thumb drive, insert the drive in to the USB port. Double-Click mirethMusic man and click the mirethMusic Play Tab.mirethMusic will display all mounted media in the “Music Source” pane. To Select tracks from the Library. Single-click the Playback Mode that you want. Use this playback mode to shuffle the selected tracks and play continuously. When the last selected track has finished playing the tracks will be shuffled again and continue playing. Use this playback mode to stop playing after the last track in the selection has played. Use this playback mode to repeat playing the selection from the beginning after the last track in the selection has played. Use this playback mode to continue playing the next track after the last track in the current selection has played. Click this button to get information on the selected track. Press Play. For further information, refer to the mirethMusic Playback Controls, below. Control the player using the Playback controls, located at the bottom right of the screen. Click the Eject Button to eject the currently selected Optical or Flash media. Slide the Volume Slider to adjust the volume. Click and/or drag the Scroll Slider to another position to move forwards or backwards in the currently playing track.